Ivan and I had the breakfast buffet on June 6, 2009. Ivan brought Jennifer a plate of food. She wasn’t feeling so good. Jennifer went back to sleep after eating breakfast. Ivan worked on his blog while Jennifer was sleeping. I read one of my monkey books, by the hotel swimming pool. Afterwards, Ivan went shopping at the Plaza Semmangi. I worked on the blog with Jennifer. 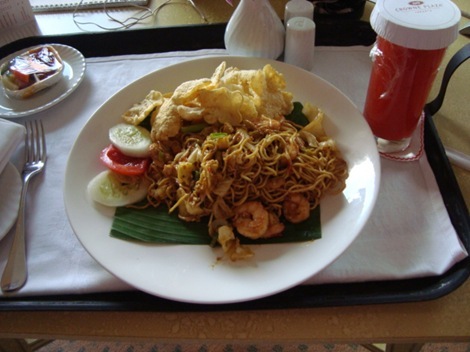 Jennifer ordered noodles with shrimp and chicken and a strawberry shake from Room Service. I ordered banana fritters. The food was fantastic! Ivan went to meet up with a couchsurfer named Yogi. Yogi picked him up in the lobby. He met his family and they fed him local Indonesian food. He ate a lot. Yogi and his family are very friendly. Ivan came back to the hotel. He said that he was meeting up with Yogi later on. Yogi had saved some chicken and tofu for Jennifer. We got ready to go out. Yogi and his wife picked us up at 9:20 pm. We were driving to FX Plaza mall. The traffic in Jakarta is so bad. There’s no monorail or subway in Jakarta. It took us almost an hour to arrive. We were meeting Yogi’s friends at Starbucks. Everybody sat down for a little while. Ivan saw a big slide while walking through the mall. 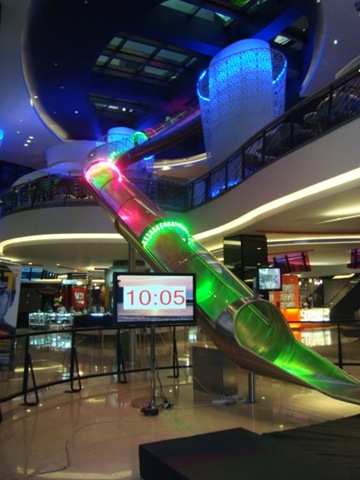 Ivan wanted to ride the slide, as he has never been on such a long slide before, inside a shopping mall. Jennifer had a headache and didn’t feel like riding. I just wanted to watch Ivan. Ivan liked the slide but his knees kept getting hit on the plastic cover of the slide. It only lasted 9 seconds, but Ivan said it was still really fun as it was so high – it went from the 9th floor of the mall all the way down to the bottom! We went back to Starbucks. Jennifer had a headache. One of the girls gave her some headache medicine. We headed to the bar Indochine. One of the girls ordered a pitcher of drinks. 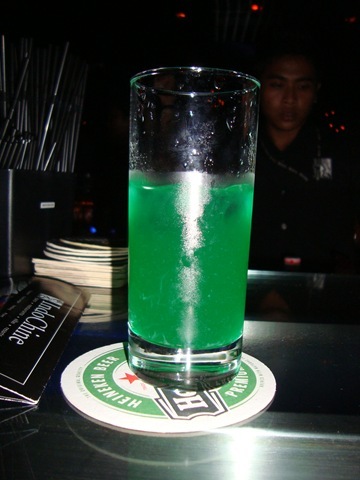 It was some green liquid, which tasted really strange. I had a banana juice which was yellow liquid and tasted great! Ivan and Jennifer didn’t like their drink – it tasted like mouthwash. The music was really loud. 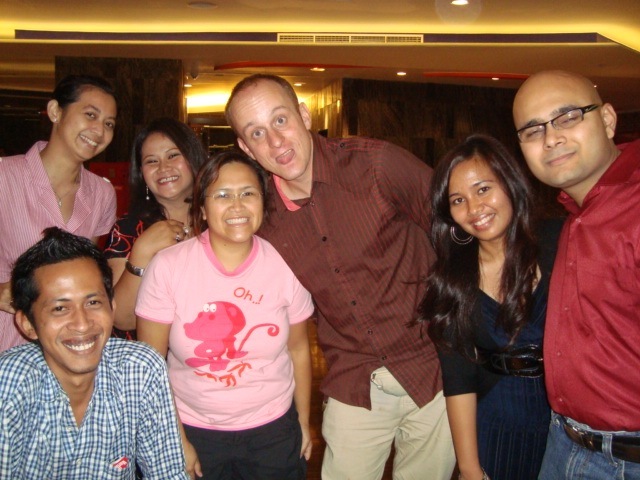 Ivan was talking to a guy from New Zealand who’s currently living in Jakarta. Jennifer didn’t feel good and decided to go back. She got a taxi back to the Crowne Plaza. Jennifer uploaded some photos to Flickr. Ivan went to the Ritz Carlton after the club. There was a great Canadian band playing at Mistere. Ivan, Jennifer and I walked to Plaza Semanggi mall on June 7, 2009. 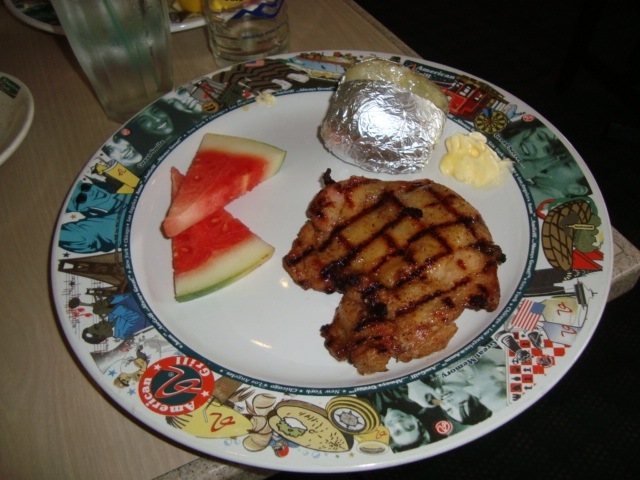 We had lunch at American Grill. Ivan had the spicy fish while Jennifer had the spicy chicken. I got chicken and banana skewers. The entrees came with the salad bar, soup and dessert. Ivan and I liked our dishes, but Jennifer thought hers was just okay. We shopped a little in the mall. I worked on the blog in the room. Ivan went back to the mall as he was trying to buy an internet broadband subscription. 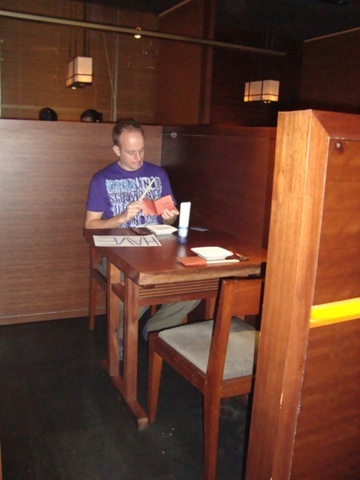 We went to the Japanese restaurant Akane in the Crowne Plaza. We got our own private cubicle. I ordered a chicken teriyaki with banana and rice dish. Ivan got the grilled salmon set while Jennifer got the chicken teriyaki set. 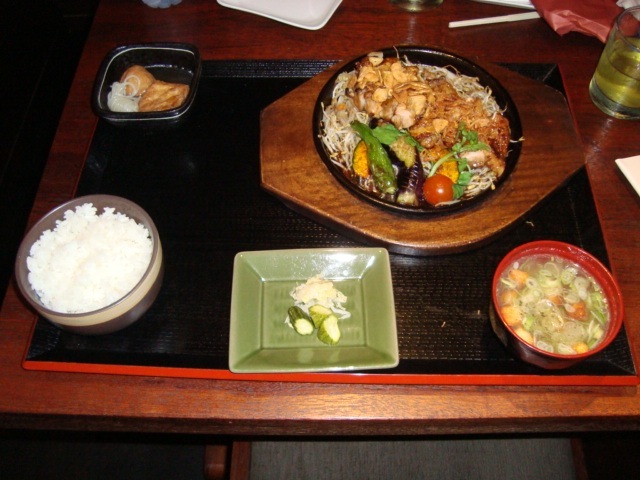 The sets come with a cold green tea, miso soup, tofu, noodles and a fish ball. The food was pretty good. We went back to the room and soon went to bed.